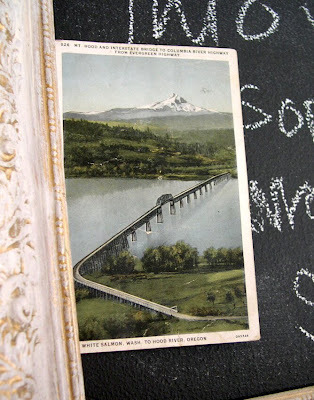 Years ago before living in the Pacific NW was even an inkling of an idea, I collected vintage postcards with snowy mountains on them. That was my 'vintage thing' at that moment. I found this card when I was living in California and little did I know this postcard was a window into my future. In the past few years, I've lived in the towns on either side of the bridge shown in that picture. Across the street and a few doors down from my house is the exact spot shown on this postcard. Postmarked 1932, Vancouver WA. I moved away from Vancouver this past Spring. If I'd known this is the way things work, I would have started collecting vintage postcards depicting chateaus in France or winning lotto numbers. That's my big blackboard I made using a vintage frame and chalkboard paint. I keep my long-term to-do list written there. Every once in a while I glance up to see if anything's been crossed off. The tiny green cup belonged to my dad. It's kind of banged up but I like it because it was his. It's perfect for a tiny cup of coffee. Today's project in the doily factory. That whole postcard story is pretty great. Your shop is looking lovely, too! Who would have ever thought that a California girl would end up living in snow? huh? Well my dear, you are in a place that is lovely...just lovely...much more than ol' Sac. There must be some good positive ions working in the atmosphere up there because your creations are always a breath of fresh air! ps: Mr. D. and Miss Fee say HI!! Great eye candy as usual. Like the postcard story - if it was French postcards our paths may have never crossed! Just over a week to go....toady was my snowman and candycane day! I love your postcard, and the story that went with it, but really liked the mug of your Dad's. I'm sure missing mine these days. How funny! I just ran across my Christmas magnets I bought from you a couple of years ago. They are so sweet. (I always forget to pack them up after Christmas so they're in the bottom of my kitchen linen drawer - time to do laundry.) Your creations just charm me! This was a wonderful story/blog. Funny and sweet my favorite combination. So-here's what you should do. Write this whole thing up with the title you used for this blog (ala The Secret) Get a book published and appear on Oprah. Then you can tell millions of people all over the world how they can make their dreams come true by placing vintage postcards in their homes. THEN - TA-DA! 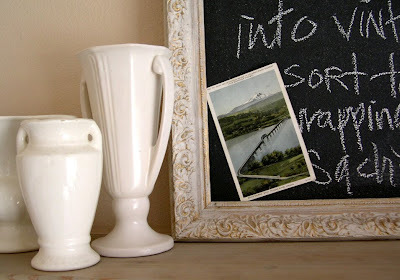 YOU will sell them the perfect vintage postcards!! 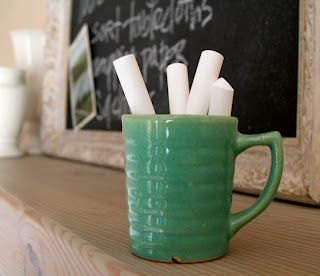 Can you tell me where to find the chalkboard paint? I was looking for it today and people just scratched their heads. I must be going to the wrong stores! Loved the postcard story. Womens intuition may be at play here somehow. Have a great weekend! A great example of visualization maybe? I think I will grab some postcards of Paris! I came over here from Cozy Little House and I love your blog. I'm off to do some exploring! I have just discovered your blog through Brenda at Cozy Little House and I love it, you have a new follower. You know, they always say to be careful what you wish for...the story of the postcard was so well written. I also liked your reason for keeping the green cup. Oh, and I am loving what is coming out of your doily factory! You are funny! Lotto number postcards...hilarious.